B2B email marketing software. Get more leads, nurture your contacts, and educate your audience. With SharpSpring, you can mass-communicate in a personalized way. Learn more about how to create compelling email marketing campaigns and build stronger relationships here. As of 2018, email is still by far the most popular and most effective communication method for B2B companies. And there are no signs of decline any time soon. What has changed, though, is how it's done. Today, the personalization options of great email marketing software is approaching that of one-on-one communication. In short, modern email marketing software allows you to build is professionally designed emails for various situations, they are easy to use, and they let you personalize your message to each recipient. SharpSpring's email marketing software allows you to do all this. When you send the right communication at the right time, you will get higher engagement, fewer opt-outs, and create a more favorable brand impression. Create mobile friendly emails with an easy to use drag-and-drop interface. Emails look good in all popular email clients, both desktop and mobile. Send email campaigns to your contacts when they've shown interest in your products, read certain pages or even interacted with your social media content. Your emails will be more relevant and multiply conversion rates compared to sending out the same email to the entire list. Feel the magic of trigger based emails. Pick a card - we'll guess which one! Try our 1 min online test now. You send the same email to your entire database. John receives information about a product he recently purchased, while Lisa gets information about how she can save money with your services. Both John and Lisa gets content tailored for their needs, and they both click and read more. Send a series of emails in a campaign that educates your contacts and helps them through their buying journey towards a purchase. The campaign adapts based on their recipients' behavior and what type of content they show interest in. Some email marketing software struggle with email design that looks good in all clients, such as Outlook. 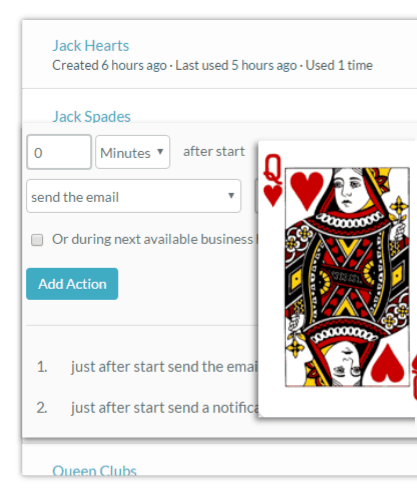 SharpSpring is built to look good on all popular email clients. You can even send a test email to various clients and get actual screenshots back showing you exactly how your emails will look so you don't have to guess. Test different emails against each other. Automatically send the best one. Get email reports and campaign stats. Learn and improve your marketing effectiveness. I need more subscribers - what should I do? This is almost a science of its own. There are just too many tactics to write about here (our project managers will help you with all this and other best practices and strategies if you work with us), but we'll try to give a brief overview of the most popular tactics. One of the most popular tactics for B2B companies to get email subscribers is Inbound Marketing. You can complement Inbound with digital ads to speed up the process. Inbound Marketing is all about offering your visitors and prospects helpful insights in return for their email. If your content is valuable, you will get links, you will be visible on search results, and your visitors will want more - and they'll want to subscribe and tell others. Read more about how to get started with Inbound Marketing here. We still get this question from time to time. Year after year, the answer is the same: Yes. Studies and surveys show that email marketing is still (as of 2018 when this page was latest updated) the most popular channel for B2B marketing, and most companies still find it to be the most effective way to build a relationship with their target audience. Based on our own audience, we see no signs of this slowing down. What has changed is how email marketing is used and what works. One thing is and will likely always be the same: Great content sells. Bad content doesn't. But what makes great content is different today than it was just a few years ago. The general trend is towards personalization. While you could blast the same email to all your contacts back then, you have to be more relevant for each individual today - otherwise you lose their interest. That's why the demands on email marketing software is increasing. Today, email marketing software needs to be able to identify your various segments, track their interests, and send personalized and relevant content to each of your contacts. SharpSpring gives you the tools you need to do this. We at FunnelBud help you use and implement those tools in the best way to maximize your impact.